Historically, Woodys music was often surprisingly connected to various dance events. As a young man in Pampa, Texas he started out playing with bands that accompanied the towns social events; church socials, picnics, gatherings, ranch barbecues and other festivities. Reels, jigs, squares, hoe-downs and waltzes were among the dances and rhythms that were a strong part of his youth. During the 1940s, while living in New York City, he performed with modern dance choreographers who were intrigued and inspired to create new dance movements to his rootsy sound. His collaboration with choreographer Sophie Maslow on "Folksay" has become legendary in the modern dance world. 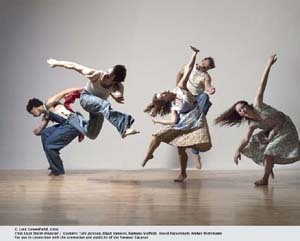 "Pastures of Plenty" recreates Woodys long and varied relationship with the many traditional and interpretive dance styles of the 1930s and 1940s. Nora Guthrie added, "My parents always talked about doing a show like this, together. My mother, Marjorie Mazia, was a dancer with the Martha Graham Dance Company and my dad often accompanied and played for folk dance parties and modern dance performances. As a matter of fact, my parents met and fell in love rehearsing one of these shows!" The Vanaver Caravan's musicians and dancers are known throughout the U.S. and Europe for their down home spirit and innovative, high powered performances. In "Pastures of Plenty", we hitch a ride with Woody across the landscape of Americas music and dance traditions. His songs are used as the basis of the journey. We feel the rhythms and the moods of Woodys people in their dances: Southern Appalachian clog dancing, Western style squares and Virginia reels, New England contra dancing, Harlems lindy hop and New Yorks modern, interpretive styles. This is a wonderful, and innovative way of introducing Woodys music to audiences of all ages. Workshops in all the instrumental and dance styles and school residencies are also available.